So 2-5 people is a huge percentage of a company's board. And the CEO, board, and voting stockholders are the directing owners of a company and can make it decide to do anything, including strategically implode golden-parachute style, or collude with monopolies from other industries as we see here in the OP. 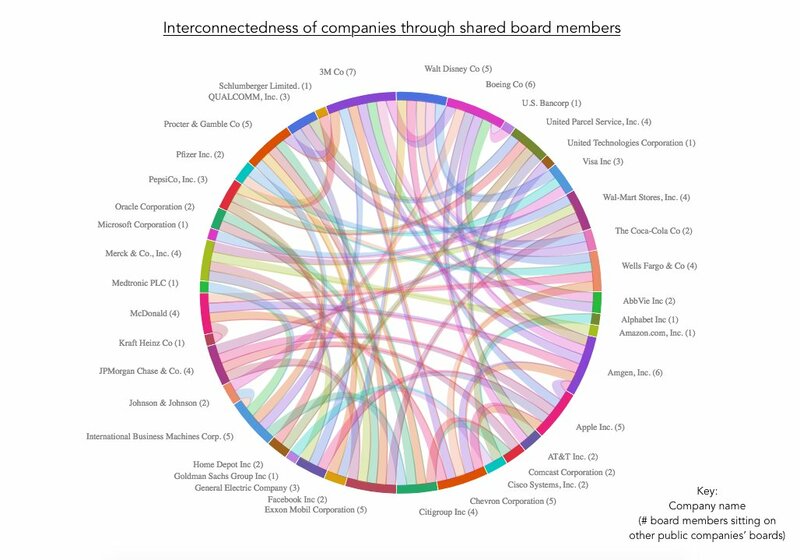 You think you're dealing with 30 companies, but really you're dealing with all these interconnected groups that support each other, right to the very top. To the point they're "intermarried" by having people on the boards of both companies. It's crazy how little anti-trust laws are enforced in modern America. Good point. So many things to boycott though... I think a low-consumption low-tax lifestyle is the way to go. We have to stop feeding the machine if we want it to stop dominating civilization.